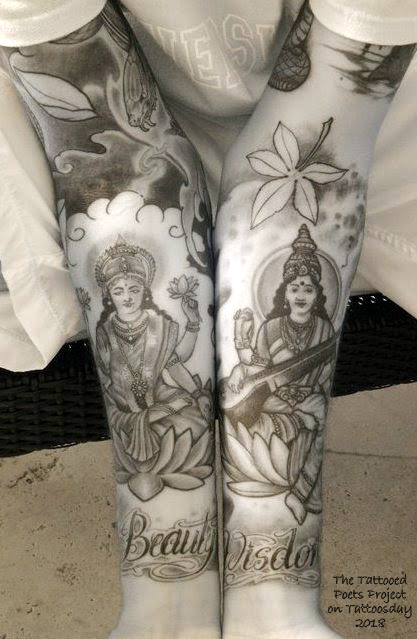 "I have Saraswati - Hindu goddess of knowledge, music, art, wisdom, and learning inside my left forearm, and Lakshmi - Hindu goddess of wealth, fortune, and prosperity on my right. They were both done (as well as their corresponding sleeves) by Federico Ferroni (@federicoferroni) of Love/Hate Tattoo (@miamiinklovehate) in Miami. I haven't had anything done recently, but I'd definitely go back to him if I decide to get any more work." and a darkening forest in its mouth. space of our foreheads where Christ was hung from. to feed with one hand, with the other, kill. Richard Georges is the author of the poetry collections Make Us All Islands (Shearsman Books) and GIANT (Platypus Press). He is the recipient of the 2016 Marvin E. Williams Literary Prize from The Caribbean Writer, and has been shortlisted for The Wasafiri New Writing Prize, The Small Axe Literary Prize, The Hollick Arvon Prize for Caribbean Literature, and the Forward Prize for Best First Collection. You can find him at www.richardgeorges.com. Thanks to Richard for sharing his tattoos and poetry with us here on the Tattooed Poets Project on Tattoosday!